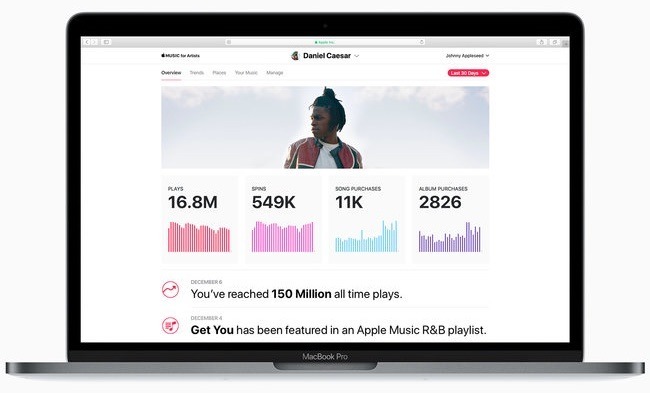 Initially rolling out to a few thousand artists, Apple Music for Artists is an analytics tool that breaks down the streams and sales of individual songs in a variety of ways. Billboard reports the dashboard offers up both high-level and detailed views on songs, including analysis using a variety of different demographics that can drill down to the target audience the artist is aiming for. From the homepage, key data including the number of plays, spins, song purchases, and album purchases on Apple Music and iTunes are provided, complete with notifications for reaching milestones. This data can be narrowed down to a specific period of time, including the last 24 hours and all activity since the launch of Apple Music in 2015. Users can also refine the data geographically, selecting specific countries from the list of 115 that Apple Music is currently in operation, and can also descend down to data stemming from an individual city. At this low level, artists can also examine the demographics for a city or region and request their music's data specifically relating to that, such as females aged between 16 and 24 based in Los Angeles. It is suggested the geographical data mining of listeners can help with selecting the locations an artist could play during a tour, and potentially to dictate the ideal setlist for each performance. Other data provided in the service includes a list of all Apple-curated playlists featuring the artist's music, and how songs and the artist themselves trend over time. Apple reportedly did consider adding financial data to the dashboard, but elected to avoid doing so in its launch, allegedly because royalty payments are allegedly complex to calculate. While it is currently offered to thousands of artists in beta, Apple Music for Artists is expected to open fully in the spring to the millions of musicians and bands who have content available on Apple Music and iTunes. It is also initially being introduced as a website, but there are allegedly plans to offer a mobile app for the service sometime after launch. It is noted that Apple believes the new dashboard will help independent acts, who typically do not have access to the data provided. Canadian R&B singer Daniel Caesar, who was consulted during its construction, suggests the analytics tool "helps to level the playing field for artists like myself," noting that small teams don't have the resources of major labels to conduct market research, information which can influence marketing decisions and other important business areas. Apple Music for Artists is the latest analytics-related service Apple has introduced or changed in the last six months. Apple refreshed the News Publisher dashboard in August last year to make it easier to access and understand analytics the service provides, while December saw the arrival of podcast analytics as an iTunes Connect beta, providing granular listener data.